ADVERTISEMENTS. OUTRE. Volume 1 Number 1, A magazine of the bizarre and weird. Midget size, 16 pages, containing drawings of an - outre' nature. Don't miss it if you like the weird. 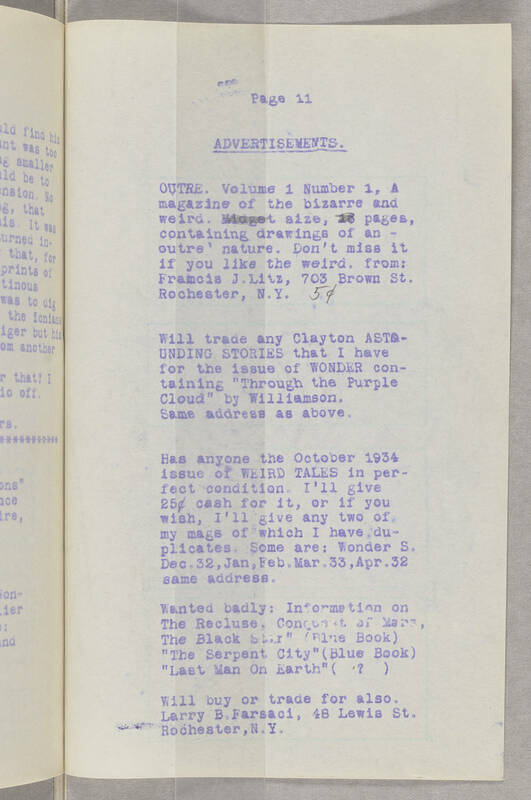 from: Framois J. Lilz, 703 Brown St. Rochester, N.Y. Will trade any Clayton ASTOUNDING STORIES that I have for the issue of WONDER containing "Through the Purple Cloud" by Williamson. Same address as above. Has anyone the October 1934 issue of WEIRD TALES in perfect condition. I'll give 25 cent cash for it, or if you wish, I'll give any two of my mags of which I have duplicates. Some are: Wonder S. Dec.32,Jan,Feb.Mar.33 ,Apr.32 same address. Wanted badly: Information on The Recluse, Concept of Mars, The Black Star" (Blue Book) "The Serpent City" (Blue Book) "Last Man On Earth" ( ? ) Will buy or trade for also. Larry B.Farsaci, 48 Lewis St. Rochester, N.Y.